Produced by the 7 Daughters of Eve Thtr. & Perf. 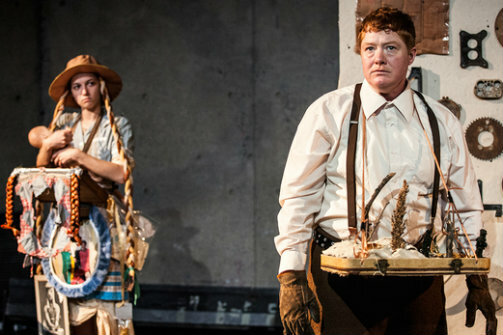 Co.
Sarah Willis and Becca Blackwell in Let Us Now Praise Susan Sontag. Photo by Maria Baranova. BOTTOM LINE: Sometimes funny, sometimes touching, and consistently bizarre. Let Us Now Praise Susan Sontag has a lot of layers. It’s technically the story of a family of Depression-era sharecroppers whose lives are being documented by a pair of journalists. However, it’s also a dramatization of the work of writer James Agee, photographer Walker Evans, and cultural critic Susan Sontag. I’m not sure who its intended audience is, but I found it by turns hilarious, moving, infuriating, and overlong. I’ve never read Sontag’s famous book On Photography (though now I want to, having seen this show), but the basic idea is that it critiques the notion that photographs are inherently honest and truthful, and specifically criticizes the images made by Evans in the 1930s as exploitative of the tenant farmers they were supposed to be helping. Luckily, writer-director Sybil Kempson makes that argument more interesting than I just did. Original music and a committed cast make this heady intellectual material an entertaining Brechtian experience. Nothing on stage -- neither performances nor costume and set design -- is meant to be “realistic,” but the emotions evoked by such numbers as “Person-to-Person” and “Letting Go” are very real indeed. The entire cast is solid, but Becca Blackwell (in a gender-bent performance) and Sarah Willis are standouts. The show has a serious problem in its structure, in that the first act is three times longer than the second. I’m sure this is by design, but it greatly tests the audience’s patience. To be fair, dialogue and events that may seem random or indulgent in Act I do pay off in Act II; however, the risk is that by then, no one will care anymore. Let Us Now Praise Susan Sontag does not seem to give a damn about anything anyone would expect of it, which is, depending on your point of view, either its greatest virtue or its chief weakness. Even its comedic aspects and musical numbers don’t hide the fact that this is theatre for those who don’t want to relax. You will laugh, you will shrug, and then you will want to go to grad school.